Senator Susan Collins has served in the U.S. Senate for Maine for 19 years, and in that time has never missed a vote – late last year, she cast her 6,000th consecutive vote in the chamber. In that time, Senator Collins, a Republican, has become known for her avid bi-partisanship, leading the effort to repeal Don’t Ask, Don’t Tell in 2011, creating the congressional coalition that ended the 2013 government shutdown, and serving as co-chair of the Congressional Task Force on Alzheimer’s, securing a more than 50 percent increase in funding ($350 million) for Alzheimer’s research last year. For the past three years, she has been ranked the most bipartisan member of the U.S. Senate by the Lugar Center and Georgetown University, and for the second time in less than a year, she was named the second most popular U.S. senator in America in a comprehensive survey conducted by Morning Consult. 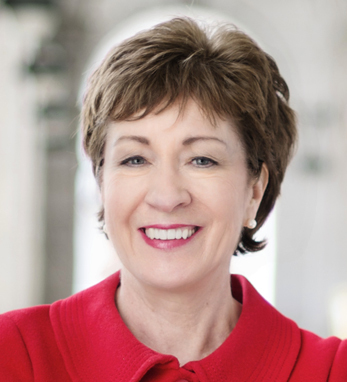 Fourth-generation Irish American on both parents’ sides, Senator Collins was raised in Aroostook County, Maine (the “Potato Capital of America”), where her family has operated a lumber business since 1844. Her first job was picking potatoes as a teenager, she says, and she appreciated the connection to Ireland the work held for her. “I am fortunate to have grown up amid the hard work, determination, innovation, and common sense that define this great industry. To me, nothing says ‘home’ like the sight of potato blossoms stretching as far as the eye can see and the heritage they demonstrate,” she says. She also attributes some of her bipartisanship to a shared Irish connection with top-ranking Democrats, particularly former Senator Ted Kennedy, with whom she says she bonded over their love of their Irish mothers. A Phi Beta Kappa graduate of St. Lawrence University, Senator Collins is married to Thomas A. Daffron and resides in Bangor, Maine.